HOUSTON (AP) — George H.W. Bush came back to Washington for a final time Monday, heading for the Capitol to lie in state as the nation paid tribute to the 41st president for a lifetime of service that began in the Navy during World War II, ended with four years as president and was characterized throughout by what admirers say was decency, generosity and kindness. 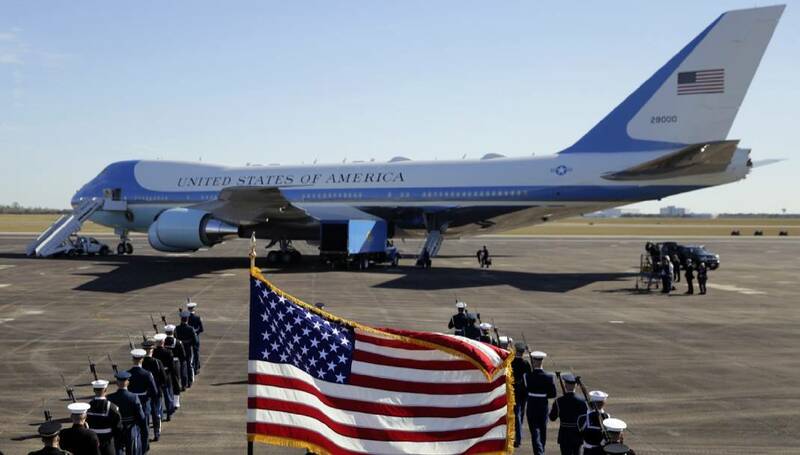 Sent off from his beloved Texas with a 21-gun salute, Bush's casket was carried to Andrews Air Force Base outside the capital city aboard an aircraft that often serves as Air Force One. Bush, who was president from 1989 to 1993, will lie in state in the U.S. Capitol rotunda for a ceremony and public visitation from Monday through Wednesday. An invitation-only funeral service is set for Wednesday at Washington National Cathedral. President Donald Trump and first lady Melania Trump are to attend. Bush's family has not said who will speak at the service. Former President Jimmy Carter also will be there. Bush's casket was to arrive in Washington on Monday afternoon aboard the U.S. military airplane. The crew was tasked by Trump with carrying out "Special Air Mission 41," a reference to Bush's place in the roster of America's presidents. Bush's passing puts him back in the Washington spotlight after more than two decades living the relatively low-key life of a former president. His death also reduces membership in the ex-presidents' club to four: Carter, Bill Clinton, George W. Bush and Barack Obama.